The best way to explore any city is on foot, taking in its sights, sounds, and smells up close and personal. But while you can stroll just about anywhere, some cities are more walkable than others, offering unique, compact neighborhoods with famous landmarks, interesting architecture, good food, and more, all within easy reach. From the car-free streets of Venice to the warren of historic passageways in Old City Jerusalem, these are the world’s most walkable cities, with suggested routes in each destination. Nobody visits Sydney without walking along the waterfront and making the trek across Sydney Harbour Bridge. 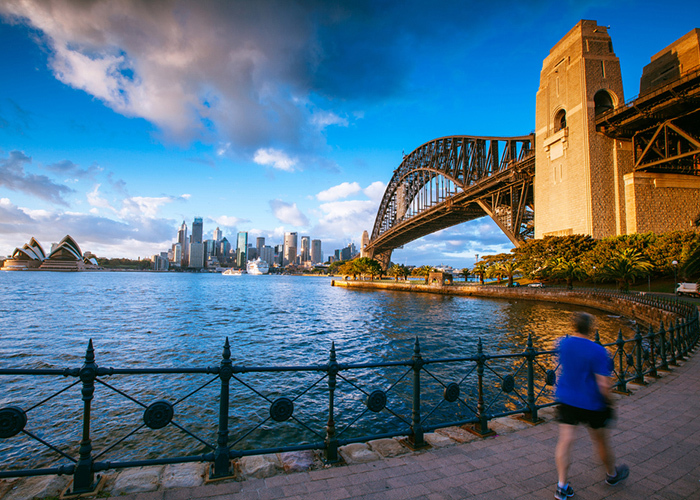 It’s in this area where you’ll find the famed Sydney Opera House, making it one of the most popular places to explore on foot, especially on a warm, sunny day. Suggested Walk: Try the Manly to Spit Bridge Coastal Walk in North Sydney, a series of marked walkways that’ll lead you past the area’s picturesque beaches and bays. Where to Stay: The Grace Hotel Sydney is centrally located in Sydney and perfect for walkers. Boston is a small “big city,” naturally lending itself to exploring on foot. 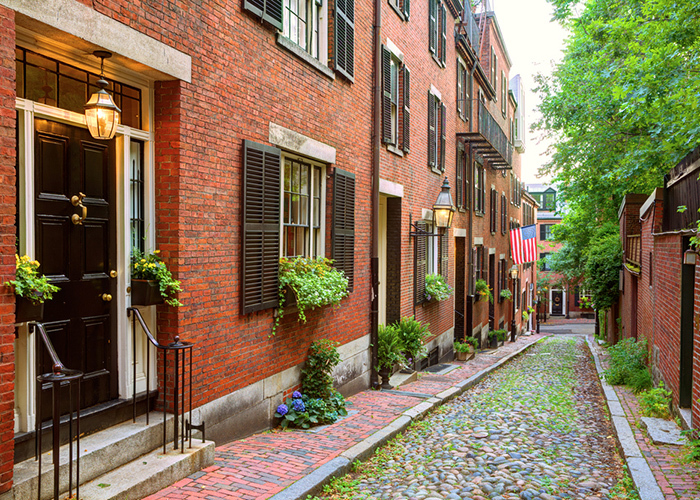 Of most interest to tourists is the famous Freedom Trail, a 2.5-mile route that takes visitors to 16 of the historic city’s key landmarks, including the Paul Revere House, Bunker Hill Monument, and Old North Church. Walking the cobblestone streets of Back Bay to Boston Public Garden is also a must. Suggested Walk: Take a stroll through the North End, where the smell of freshly baked cannoli and pizza wafts through the air, drawing visitors into the neighborhood’s many Italian eateries. Where to Stay: The charming and historic Lenox Hotel is located in the heart of Boston and just steps away from public transportation. 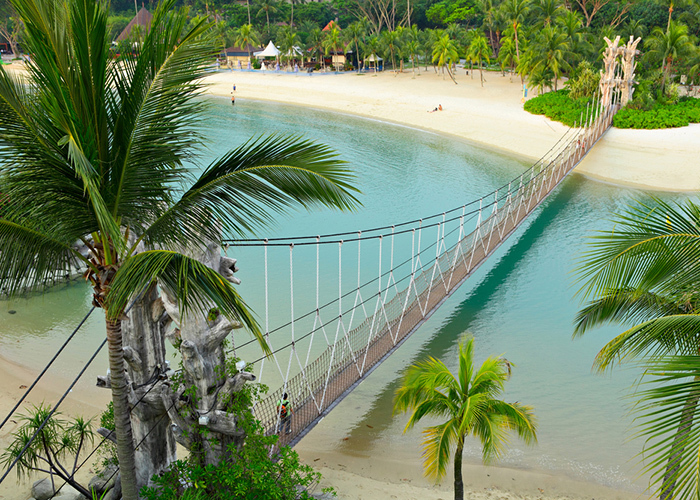 There are seemingly endless ways to enjoy the landscape of Singapore on foot—from waterfront walks along the city’s beaches to strolls through forested parks and historical neighborhoods. Some of the most unique areas include Gardens by the Bay, a fantastical garden, and the Helix Bridge, which affords beautiful views of Marina Bay—particularly at night. Suggested Walk: It’s popular, but it can’t be missed: Singapore’s Southern Ridges Trail takes travelers through the forest to the highest pedestrian bridge in the country. Where to Stay: Marina Bay Sands, the iconic Singaporean landmark, boasts breathtaking views and a convenient location. 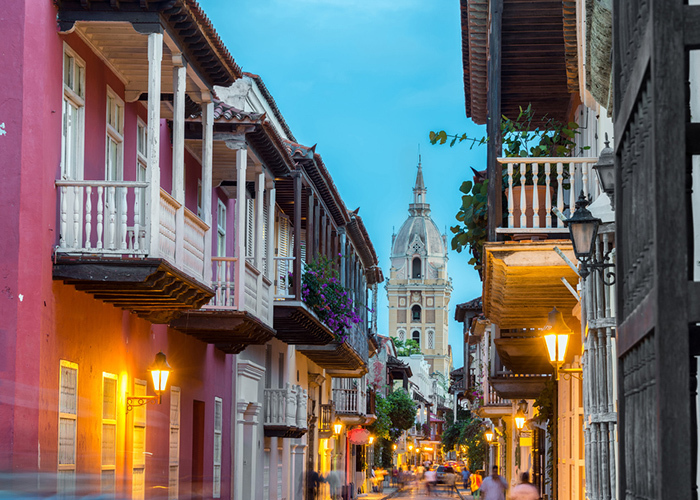 Cartagena continues to grow in popularity thanks to a downtown district reminiscent of New Orleans, with historic charm by day and a lively scene by night. Outside of downtown, walk through San Felipe de Barajas Castle to explore a 16th-century fortress, or head for the area around Iglesia de la Trinidad, a trendy neighborhood with restaurants, bars, clubs, and delicious street food. Suggested Walk: Walk the city walls for a different perspective on this UNESCO World Heritage City. Where to Stay: Trendy Hotel Caribe is great for walkers and near many of Cartagena’s most famous attractions. 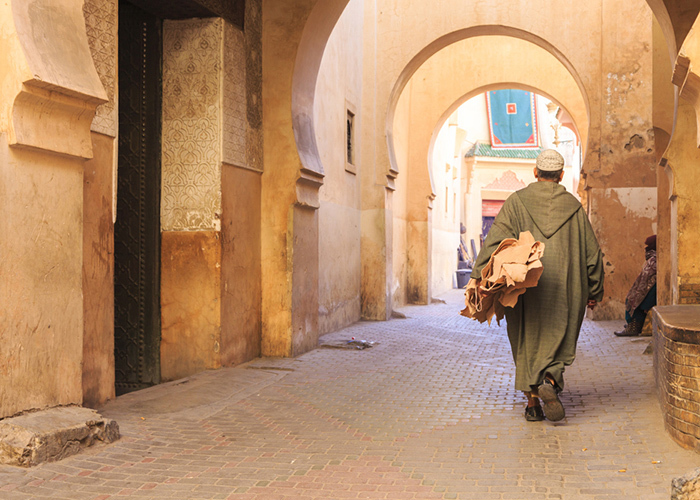 You can explore the deserts of Morocco by car or camelback, but if you want to immerse yourself in the culture of its people and neighborhoods, you’ll want to do it on foot in the country’s fascinating cities. In Fes you can explore ancient palaces, such as Glaoui Palace (the intricate tiles and well-kept gardens are impressive), or stop at a local tannery to see how leather is made. Suggested Walk: You can’t go to Fes without getting lost in the medina, a maze of walkways that preserve the history and culture of this ancient city. You’ll see locals weaving carpets, molding pottery, and preparing traditional Moroccan meals along the way. Where to Stay: A stay in the iconic Riad Le Calife is perfect for walkers in Fes. San Antonio‘s top landmarks are clustered together, making it easy to see most of them by foot. 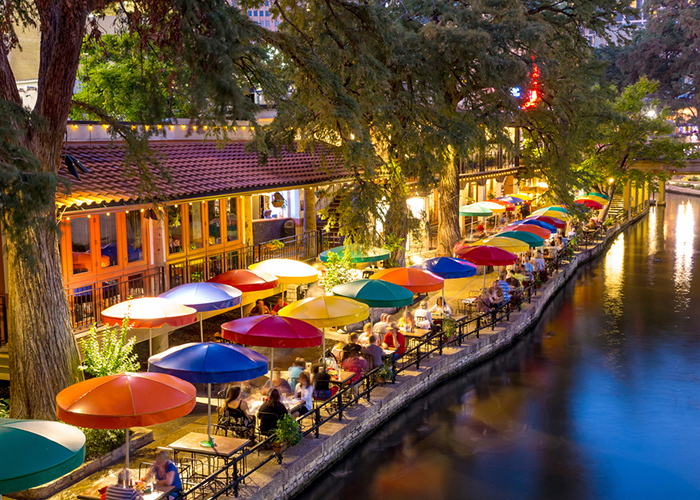 The River Walk, lined with shops and restaurants (don’t miss Boudro’s), is within easy walking distance of the the Alamo, which in turn is near several other missions worth visiting. Suggested Walk: Stroll through the Pearl Brewery, a hip complex with a weekend farmers’ market, a dance hall, seasonal events, and more than a dozen restaurants and cafes. Where to Stay: Omni La Mansion del Rio is steps from San Antonio’s greatest highlights. No visit to the City of Light is complete without a romantic stroll down the Champs-Elysees to the Arc de Triomphe, ducking in and out of luxury shops along the way. 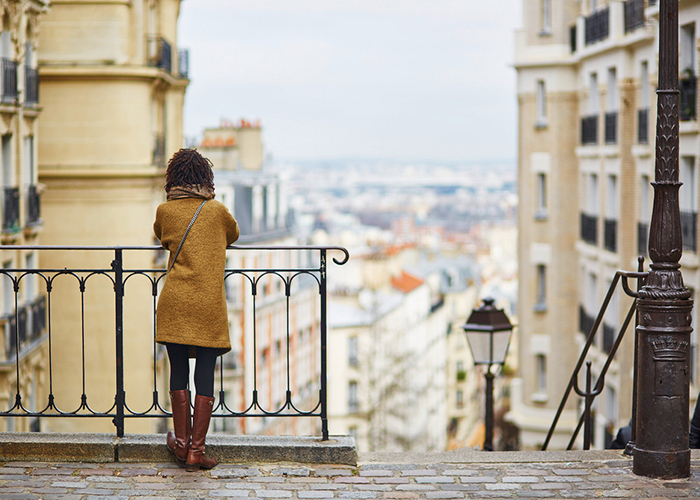 The city’s many neighborhoods beckon travelers to take a walk (and snap lots of photos), including our favorite, charming Montmarte, home to the Basilica of Sacre-Coeur. Suggested Walk: Explore the spooky side of Paris with a walk through its infamous catacombs, a series of dimly lit passageways under the ground. Where to Stay: Citadines Saint-Germain-des-Pres Paris is right along the Seine and walking distance from iconic Parisian landmarks. 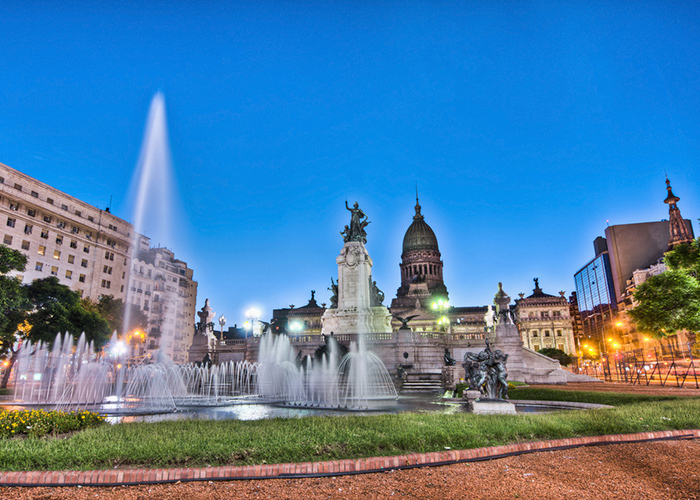 Some call Buenos Aires the “Paris of South America,” partially because of its walkability to just about anything—museums and cathedrals; neighborhoods such as the Recoleta for shopping; and parks that include Paseo del Rosedal, with lushly landscaped walkways and thousands of roses. Suggested Walk: Stroll the tree-lined streets of Palermo Soho, a trendy area with bars, restaurants, and nightlife. You can even take a street art tour (see Graffitimundo.com). Where to Stay: Hotel Madero offers a view of the water and a central location in Buenos Aires. 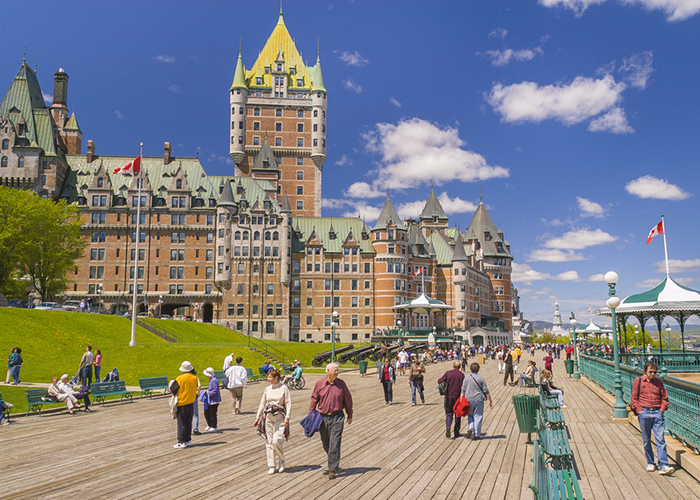 Quebec City makes us swoon with a downtown that’s reminiscent of France and a castle-like hotel (Chateau Le Frontenac) with commanding views of the city. Stroll along Rue Saint Louis, the city’s most photographed street, lined with European-style cafes. Shoppers should walk the Rue de Petit-Champlain, the oldest shopping district in North America. Suggested Walk: Escape the city center with a picnic lunch (perhaps some cheese and wine from a store downtown) and drive to Montmorency Falls, where you can walk the paths and cross a suspension bridge over a thundering waterfall. Where to Stay: Auberge Saint-Antoine is located in the heart of Quebec City and just a few minutes’ walk from the city’s attractions. 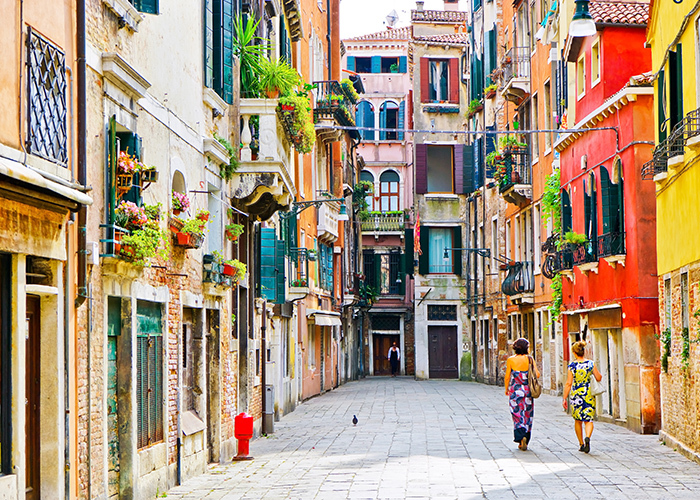 With its complete absence of cars, Venice takes the idea of walkable cities to a new level. Leave St. Mark’s Square behind (after the obligatory photos, of course) to let yourself get lost in the city’s maze of villages within villages, where locals’ laundry flutters in the breeze over narrow alleys and little cafes open their doors for alfresco dining. Suggested Walk: Take a boat to Burano, a delightfully colorful village that can also only be explored on foot. Fun fact: Pisa doesn’t have the only leaning tower in Italy. Burano has its own tilted building, the leaning bell tower of St. Martin Bishop. Where to Stay: The historic Hotel Antiche Figure is perfect for walkers and right next to the Grand Canal. You won’t find tacky bus tours within the walls of ancient Jerusalem, whose holy sites—including the Western Wall, City of David National Park, and Hezekiah’s Tunnels—can only be explored on foot. Other great places to wander include the Jewish Quarter and the beautiful landscape of the Mount of Olives. 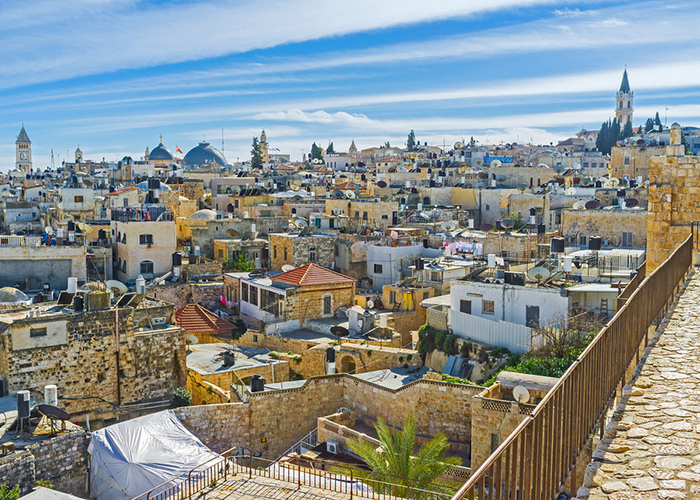 Suggested Walk: Walk on the walls of Jerusalem’s Old City to look down on its historic streets from above. Where to Stay: Eyal Hotel is in the heart of the Old City and near Jerusalem’s best attractions. 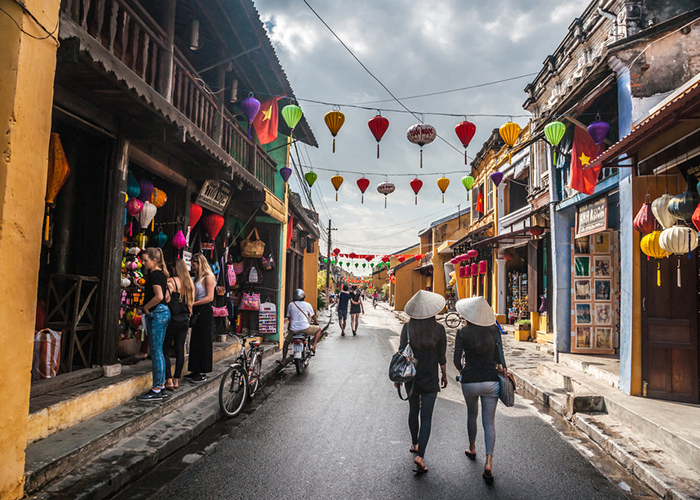 Formerly an important trading port, Hoi An is now a UNESCO World Heritage Site. Visitors can wander through the city’s Ancient Town, where restaurants and food stalls beckon travelers to taste local dishes. The town is even more exciting at night, with traditional lanterns illuminating the streets. Suggested Walk: Take a street food walking tour, led by locals, to taste your way through Hoi An. Where to Stay: Victoria Hoi An Beach Resort & Spa is located right on the water and is great for walkers.